As concerns have recently reemerged over the level of violence in the South Seattle area, the Emerald spoke with Seattle City Councilman Bruce Harrell, who chairs the city’s Public Safety Committee, and who also recently led a community discussion on violence reduction at the Southeast Seattle Senior Center. 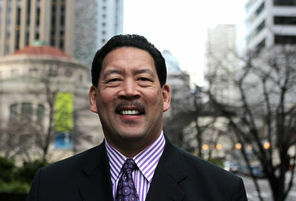 Councilman Harrell currently resides in South Seattle. Emerald: You recently led a community forum on the topic of violence prevention in the South Seattle area. Community Meetings, as they relate to violence, are dismissed by many as a “token” response that rarely ever results in any action being taken. Why should residents have cause for optimism after this particular meeting? Bruce Harrell: First of all we are developing an actionable plan that we should be able to announce this month. We’re putting not only resources behind it, but best practices we’ve taken from other cities, as well as some creative ideas about how to protect our community in the South End of Seattle. So my attitude about meetings like that are, number one, I try to make sure that we can talk about everything, including things our own community can do. An example would be that one East African attendant spoke up and said that: “You know, I don’t see East Africans here and you need to do better outreach to make sure that my community is represented at these kinds of meetings.” I told him that he was right, and that we would do everything possible to do that, but I added: “You need to do the same thing. You need to figure out, how we can reach your community, as we have tried to reach out.” We established an immigrant/refugee commission, specifically for that purpose. We now have an East African person in our Police Academy, which we’re proud of. That’s a prime example to me of, when people are demanding that others do things, that they feel empowered to do it themselves. I live by a quote: “You either accept things the way they are, or you accept responsibility for changing them.” So, I think that the meeting was a very good one. It gave people the chance to meet our police officers and to let them know that we do care about South Seattle, and that they do have leaders who are developing plans to protect our community. Emerald: Some people say that the easy remedy to violence in the area is to simply have more police officers around, however, an expanded police presence is a very polarizing issue amongst South Seattle residents. How can it be assured that police officers are viewed as actual partners with the community in fostering a safer South Seattle? BH: The fact of the matter is that we can not have police officers on every corner arresting kids for just standing around being who they are. We also have to give our own community leaders the tools to empower themselves. I think that there are people who have come from the street life, and have found a way to overcome it. They have dealt with the negative messaging that they have received in their lives and now are giving back and can help us improve our communities. I think that as an investment strategy we need to know who these individuals and groups are, and we need to double down on them. Again, we all know that we can’t arrest ourselves out of all the problems we have. We need to flood the streets with these kinds of good folks. I also think that our officers need to be better trained to build community trust, and community relations at every opportunity. I recently attended a meeting at Rainier Beach High School, and I watched a couple of officers stand by the hallway and simply watch the crowd for a long period of time, to then only walk out of the school and get right into their car. What I wanted to impress upon the officers is that this is the time you build community, and public trust. So I want to see more officers, like Captain John Hayes, who seems to know everyone’s name in the community, and who can walk around and mix it up. Because when we couple that with the right kind of outreach, we can move the needle. The other component is that the “no snitch”policy is a cancer to our community, and when we see shootings, we need to be able to break that. What has been effective in some other cities is to get high profile spokespeople, athletes, celebrities, people that come from the community, to help us change that cultural norm and that has to be very intentional when we are losing these lives. Emerald: How do you think the city can empower organizations that are currently working in South Seattle to address the public safety issue? BH: Right now I’m trying to figure out what organizations have the ability to scale up, and provide us some capacity to move the needle in terms of cultural norms, and can really make a difference. So, I think the first thing we need to do is take an inventory of these organizations and invest in them. The city’s role then is to be the quarterback or the facilitator in allowing these organizations to do what they do best, and that is reaching the community and changing the conversation, so that communities can feel empowered to protect themselves. Emerald: Economic Development has often been trumpeted as a silver bullet for public safety concerns around South Seattle, however, many people view it as a “trojan horse” for gentrification. You would be hard pressed to find a resident who wouldn’t love all of South Seattle to be a consistently safe and vibrant place, but they would also love to still afford to reside there when that happens. Could you address that issue? BH: I think it first starts with a vision, and that vision has to be described with some level of specificity. So if I was to describe a great vision for South Seattle it would be that it remains affordable, so that you wouldn’t see huge seven figure homes in these areas with very few affordable homes and it would be safe. so I don’t think that you compromise price just because it becomes safe. That’s where the beauty of small business comes into play. You have to have a barbershop, a pizza place, a small restaurant, or a store where you can buy clothing. You have to have a vibrant small business atmosphere that, again, is safe and has parking, that you can use transit to get there. It has to be vibrant, so that anyone, from any part of town, feels comfortable going there. A great example is the resident led resurgence going on in Hillman City. You don’t have that vibrancy in some areas of South Seattle. The medical cannabis dispensary is not the kind of small business that attracts a lot of patrons; they only attract a certain kind of patron. So the vision is of safe, active, vibrant, small business development, affordable housing, open space, parks that are activated, police officers who walk and ride bikes around, that’s a good community and an affordable community. Emerald: With our potential police chief, Kathleen O’Toole, being an outsider to the city, many have questioned if a person who lacks a familiarity with the area can really hope to address the concerns of South Seattle. What is your feeling on that? BH: I would have absolutely loved to have had a chief who knows all parts of our city, in particular the South End, but we don’t have that. The mayor made it clear that it was his preference to go outside the existing culture, and I accept that. So now, what’s most important is that Chief O’Toole gets the intel needs and that she has actual experience with dealing with some of the roughest neighborhoods in the country, and she does. I sat in on her interview panel, and that was exactly my line of inquiry. She spent a lot of time overseas as well, and I wanted to make sure that she had the credibility and experience in dealing with some of the tougher areas, and I’m fully convinced she does. In fact I think she will shine in that regard. She will have a learning curve to know the players in the community and so forth, but I think she is a quick learner and I think we’ll be very pleased with her ability to adjust. Emerald: There’s a lot of conversation that if Rainier Beach, Skyway, Othello, etc, where instead Fremont or Wallingford, the type of violence and crime that’s been experienced wouldn’t be accepted by the city. What can be done to fix the perception that there is a divide in what the city tolerates in certain areas in comparison to others? BH: If you walk other neighborhoods, and parts of this city, as I do, such as Lake City Way, University District, Pioneer Square, you will hear the exact same thing, that conditions are intolerable, yet the city leaders do not make the right level of investments into those areas. The fact of the matter is using federal funds, state funds, and city funds, we should again double down on the South End, because of the rates of poverty, the rates of unemployment, the graduation rates that aren’t where we need them to be, and I think that while we can greatly improve that, we don’t have leaders who are neglectful of that part of town. As someone who sees these drive bys and shootings, I understand the frustrations people have, and I don’t mean to minimize them, but many of us have been dealing with them for 30 to 40 years, and I think it’s symptomatic of what’s happening in our country. You notice in almost every city, in every state, you have under invested areas, but I’m very optimistic that we’re putting strategies in place to improve them. Cleveland High School is a great example of that. The graduation rates have gone up 20 percent and the PTA has broken records in fundraising! So there are things that are rising in the right direction and what sets us back is another dead body found in the street. I have written emails to the Mayor but never hear whether he actually sees or reads them. We are fortunate in South Seattle to have young couples purchasing homes because the prices are more affordable in our area. This needs to continue. We should be concentrating on affordable homes and housing, not more low income housing. Our area has already had more than their share. What we need is more businesses. More shopping areas. We need a mini “Landing” like exists in Renton. Replicate something of that sort on the Lowe’s property…(keeping perhaps a smaller Lowes)…and the residents of Southeast Seattle would feel that we’re being listened to.